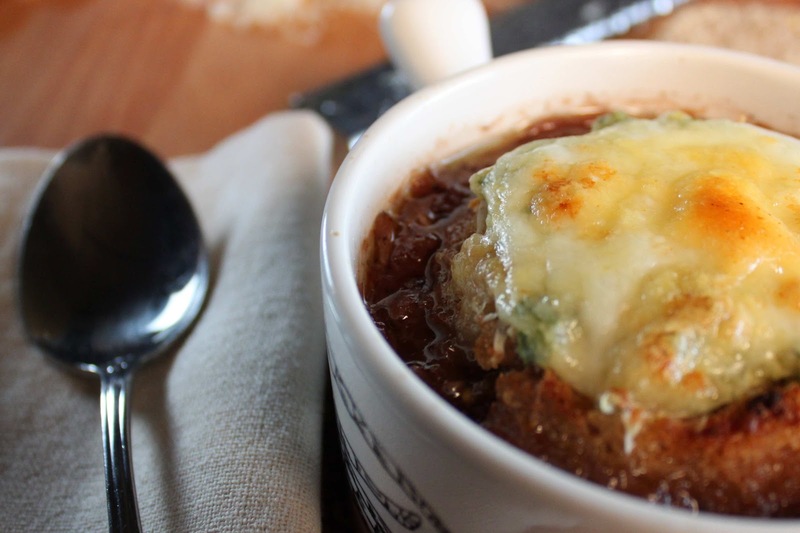 French onion soup- imagine for a moment you had never tasted it ..... would it really sound interesting based on name? 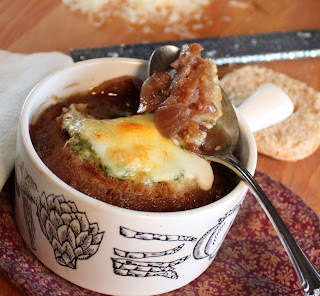 Does onion soup intrigue you? I'm convinced that even if I didn't know French onion soup is a heavenly mouthful of sweet caramelized onion and deep red wine soaked crouton all covered in melted mozzarella cheese that I would still like it. Yes, onion soup would intrigue me. It's really a super simple soup to make as well as cost efficient considering onions and bread are quite cheap. 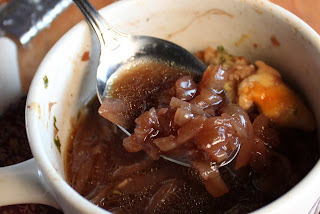 The key is to have the patience to saute the onions until they are caramelized to a soft, sweet and succulent stage; if you rush this step, your soup will miss out on the biggest depth of flavor. Putting my own spin on this soup, I added a little extra flavor to the crouton with a mustard and parsley spread. I also use a bit more red wine than most recipes call for, but the mustard and the wine combine together for a lip-licking, fantastic soup. Have no fear of the onion soup, it's nothing like a raw onion. Do it the Fat and Happy way - pour yourself a glass of red wine and then pour one for the soup. It's comforting, hearty, filling and superbly flavor. Tips and Techniques: I enjoy using a variety of onions - Spanish, red and white - to give the soup the best flavor. But you can use just one type of onion if you prefer. With regard to the cheese, I prefer to go a little light handed but you are welcome to douse your soup with as much of the good stuff as desired. In a large soup pan, cook the onions, olive oil and butter over medium-low heat for 10 minutes. Add in the brown sugar and continue to slowly caramelize the onions for another 20 minutes with cover on, stirring often. Add in the garlic cloves and cook for another 2 minutes. Add in the red wine, beef broth, salt, pepper and bay leaves, cover and simmer for 30 minutes. In the meantime, mix the mustard parsley spread below. Ladle the soup into the soup bowls, place a crouton in each bowl. Top the crouton with desired amount of cheese and place under the broiler until the cheese melts. Bowls will be hot, serve carefully with a hot pad or on a secure plate. Mix together the mayo, mustard and parsley. Toast the bread, slather each toast piece with the mustard mix and continue with the directions above.